When my children switched from workbooks to textbooks, they had trouble producing a neat, orderly math paper. Checking their work was very difficult! So, out of necessity, I had them do their math on paper that had blocks drawn on it. One math problem was to be worked per block. This helped with the orderliness, but not with the neatness. My solution with the neatness problem was to have them write the numbers 0-9 neatly across the top of the math paper before each lesson. This helped to remind them to write neatly throughout the lesson. During grades 4 and 5, it helped each of my children to have a multiplication table handy when they did their math and by the 6th grade they had no need of the table any more. 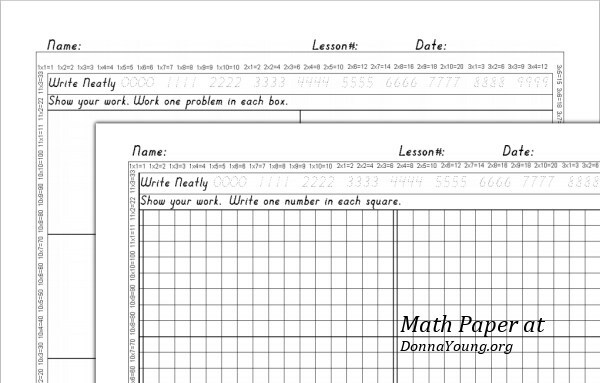 The printable math work paper below has all of the features that might help your child make the switch for workbook to text. After a while your child will not need to use this paper. My children later used sewn composition books. I wrote about that below. "Show your work. Write one problem in each block." If your child is confused about this when using the graph-block paper, explain that the "block" is the large rectangular area that is enclosing the graph lines. To mom: When your children are learning a new concept it is important for them to "show their work." That means that they should write out the entire problem and work it on their paper, not on scratch paper. This is important because if they make errors, you can see what they did wrong. This makes correcting math more productive. It isn't enough to just say, "You missed this one." You should go over the missed problem, find the error that your child made, then go over it with your child. You will discover that many errors are simple errors, [adding instead of subtracting, not carrying numbers, forgetting to borrow, making mistakes when copying the problem from the book]. Learning to be neat, and then being neat, helps with the simple errors. Once your child is aware that he makes these simple errors and realizes the importance of neatness, and paying attention to the pluses and minuses, then he should do better. [It's a process that takes a long time.] Until then, gentle reminders about neatness and carefully copying the problems are in order. Doing problems "in their head" is ok after they have learned how to do new concepts and as long as they are not missing the problems. If they start missing the problems, have them show their work again so you can determine what they are doing wrong. The math lesson paper is divided into 10 blocks per sheet. One set has a graph in the blocks and the other one does not. Then you have the choice of using the files with or without the multiplication printed around the paper. Does Not Say "Show Your Work"
Uses Print Clearly font for number handwriting practice. We used the sewn composition books for our daily math work all the way through high school. I have stacks of them. They usually do not come apart and they are comfortable to use. There are no wires, the pages are not perforated, and the notebook is easy to handle at a table or on the lap. The only problem with these notebooks is that your children can go through them quickly, but on the other hand, that is only one minor negative. The positive aspects of these notebooks outweigh the negative especially when you can find these composition books for as little as fifty cents each during "back to school" sales. My son divided the pages by drawing a line down the center of the right-side page and then several horizontal lines to make several blocks. If he has to work a problem and if he did not have enough room in the block, he worked the problem on the left-side facing page. Later, he stopped drawing the lines and worked his math problems neatly. My daughter did the same thing in her compositionbooks as my son but her work was nightmarish to grade for a long time. While her handwriting was good, she packed all of the numbers in the block in any way she could. I talked to her about that and she assisted me by writing the answer in larger numbers and by drawing a bold circle around the answer. Over time her work became neat. When I required them to show their work in the composition books, a thing they did anyway with some problems without my requirement, I came upon a new problem - the worked problems took too much time to locate. A person does not want to spend any more time than necessary to evaluate work and I talked to them. I ask them reference the worked problem to the problem with the problem number. My kids work the problems on the left side facing page. They circled the "work" and referenced it with the problem number such as #1, #2, etc.